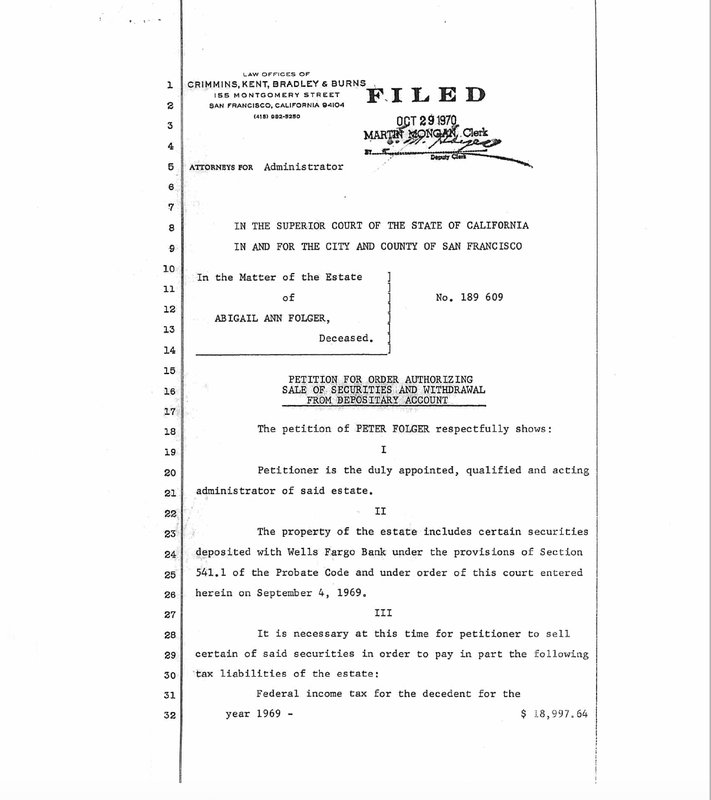 On September 4, 1969, Abigail Folger’s father, Peter Folger, opened probate proceedings in the Superior Court of California in San Francisco. Abigail had died without leaving a will. 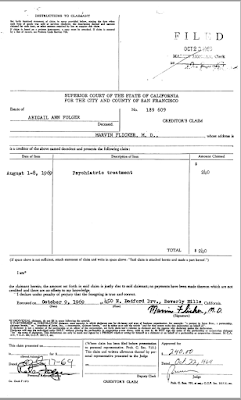 Under the laws of intestate succession (no will) her heirs were her father, Peter Folger, and her mother, Inez Folger. 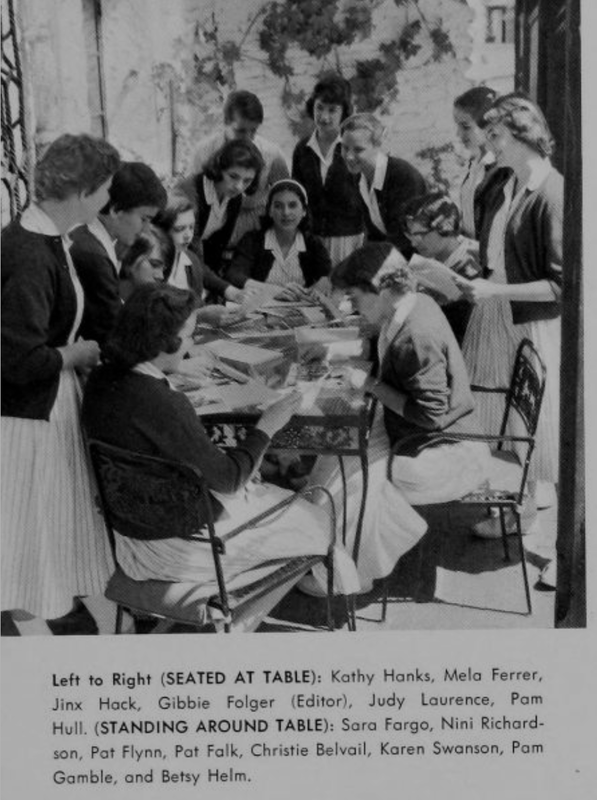 Her brother, Peter M. Folger and her half-sister, Elizabeth were contingent heirs, meaning they would not inherit unless her father and mother declined to accept the inheritance. Peter Folger, senior, was appointed the executor of her estate and received what are known as letters of administration. An appraiser, Spiron J. Tentes, was appointed by the court to value Abigail’s estate for tax purposes. Dr. Flicker was Abigail’s psychiatrist. He submitted a bill for his services from August 1st through the 8th for $240. The 8th of August was a Friday, as was the first of August. 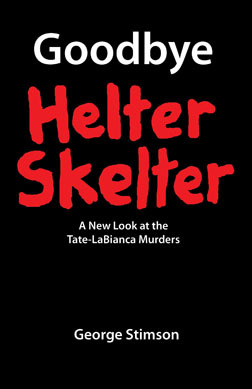 If we assume Abigail saw Dr. Flicker every day as Vincent Bugliosi claimed in Helter Skelter, Dr. Flicker's claim supports that claim. He charged $40 an hour. Dr. Flicker’s submission confirms that Abigail saw Dr. Flicker on the afternoon of her death. But it also tends to refute the idea that she was at Esalen or anywhere else in the eight days leading up to her death, except, perhaps, Saturday the 2nd or Sunday the 3rd. 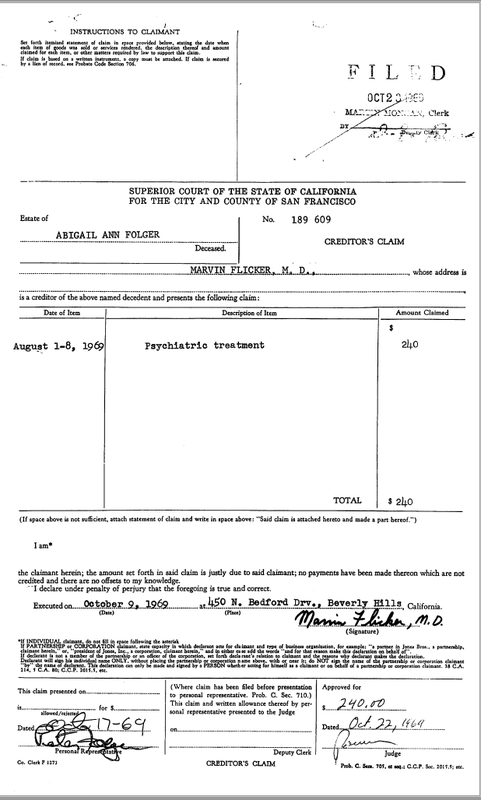 Her appointment was at 4:30 p.m. Dr. Flicker’s claim specifically says it is for treatment from August 1-8, 1969. If she was out of town on any of the week days one would have expected the dates of service specified to omit those dates. 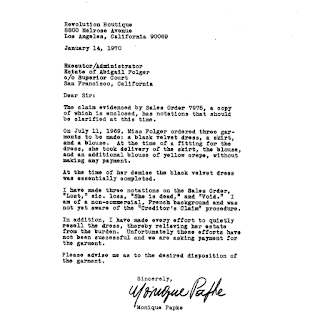 Bugliosi places Manson at Esalen on August 5th. 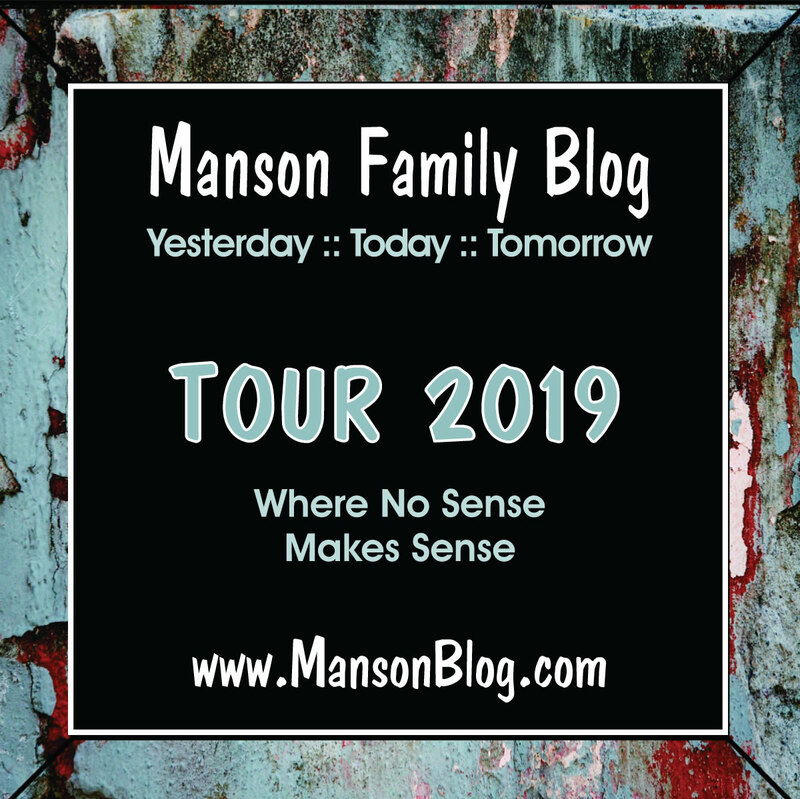 "On the night of the fifth Manson and Stephanie drove north to a place whose name Stephanie couldn’t recall but which Manson described as a “sensitivity camp.” It was, he told her, a place where rich people went on weekends to play at being enlightened. He was obviously describing Esalen Institute." Aside: Ed Sanders in The Family calculates the date as August 3rd. I tend to believe Bugliosi since his investigative resources were better. It is interesting that in the formal court pleadings closing Abigail’s estate where the creditors’ claims that were paid are listed this claim is listed as “medical services”. Perhaps that is evidence of Peter Folger’s efforts to protect his daughter’s reputation. Peter Folger accepted and paid the claim. 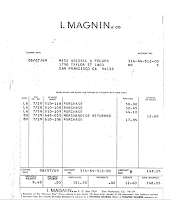 These were the funeral home expenses including the cost to transport Abigail’s body from Los Angeles to San Francisco. They totaled $1,420.86. This claim was also accepted and paid. 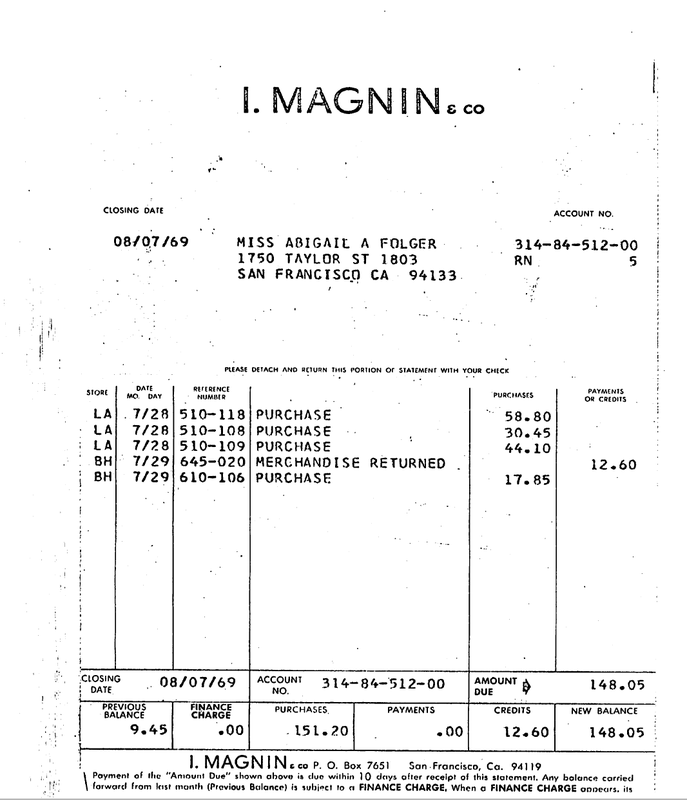 Abigail visited two I Magnin stores in Los Angeles in the month prior to her death. On July 28, 1969 she shopped at the Los Angeles store and on the 29th she shopped at the Beverley Hills store, the same location where Joan Didion purchased Linda Kasabian’s court dress approximately one year later. Peter Folger also accepted this claim. On July 10, 1969 Abigail purchased three hardcover books and twelve paperbacks from the Pickwick Bookshop at 6743 Hollywood Boulevard in Hollywood, California. She gave as her address the home she was renting at 2774 Woodstock Road. If we assume that charges were due within 30 days this may be an indication that on July 10th Abigail did not plan to be at Cielo Drive long after August 10th. The claim was accepted. 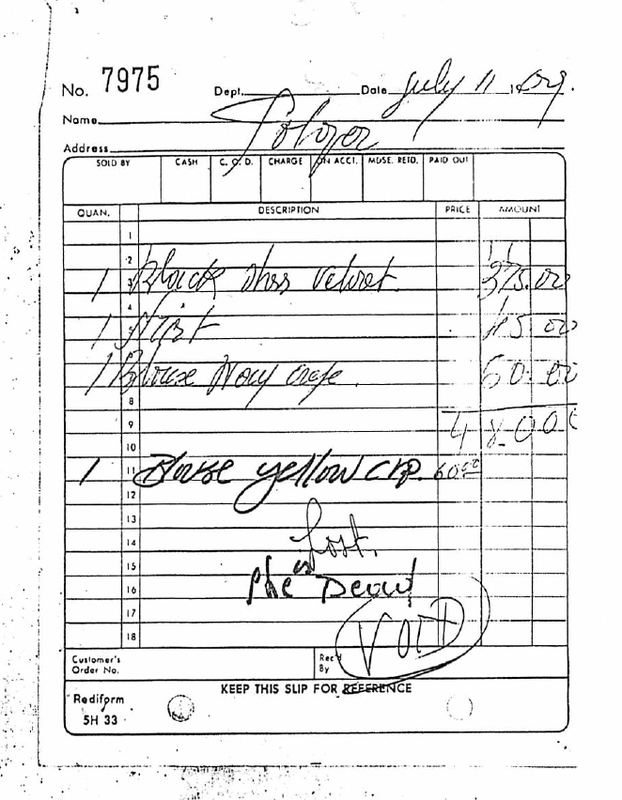 These were her funeral expenses, including white flowers (not yellow) for her funeral. The claims were also accepted. This shop was located at 8800 Melrose Avenue in Los Angeles. 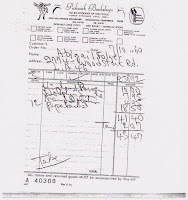 On July 11 Abigail had commissioned several articles of clothing to be tailored by the proprietor for the sum of $540. That would be $3600 today. 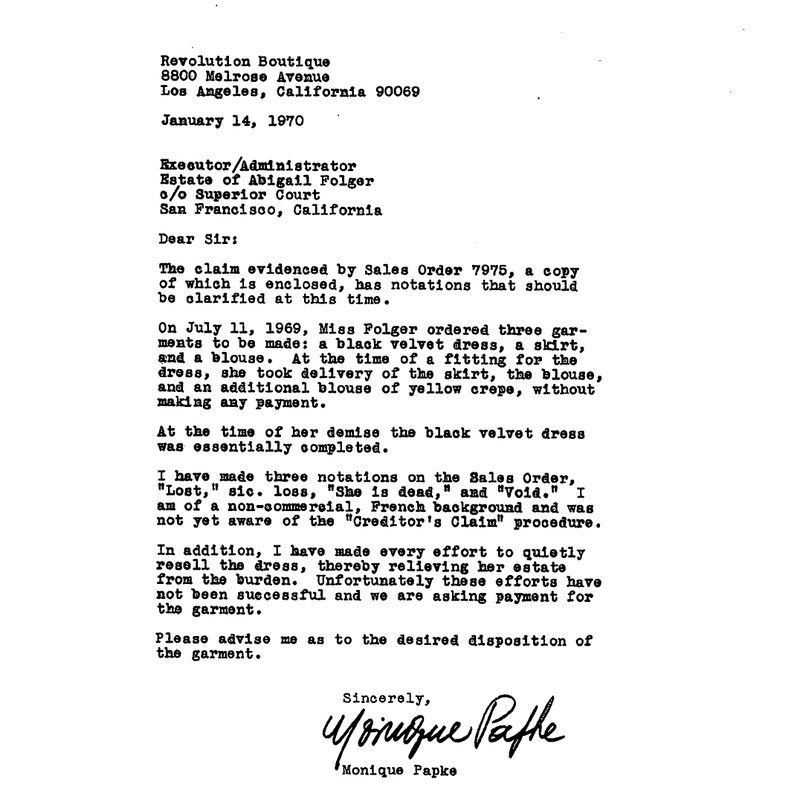 A letter from Ms. Papke’s was attached to her claim. It appears to the right. Aside from displaying a somewhat insensitive response to Abigail Folger’s death Ms. Papke filed her claim late. Peter Folger denied the claim. What is missing from the creditor’s claims is any claim for rent at 2774 Woodstock Road. Abigail probably had paid the rent for August by the 8th. However, there is no claim for any remaining balance on a lease. This could mean that Mr. and Mrs. Schultz, the landlords, simply forgave the debt under the circumstances. It could also mean that Abigail did not sign a lease for any specific term and was a month to month tenant. 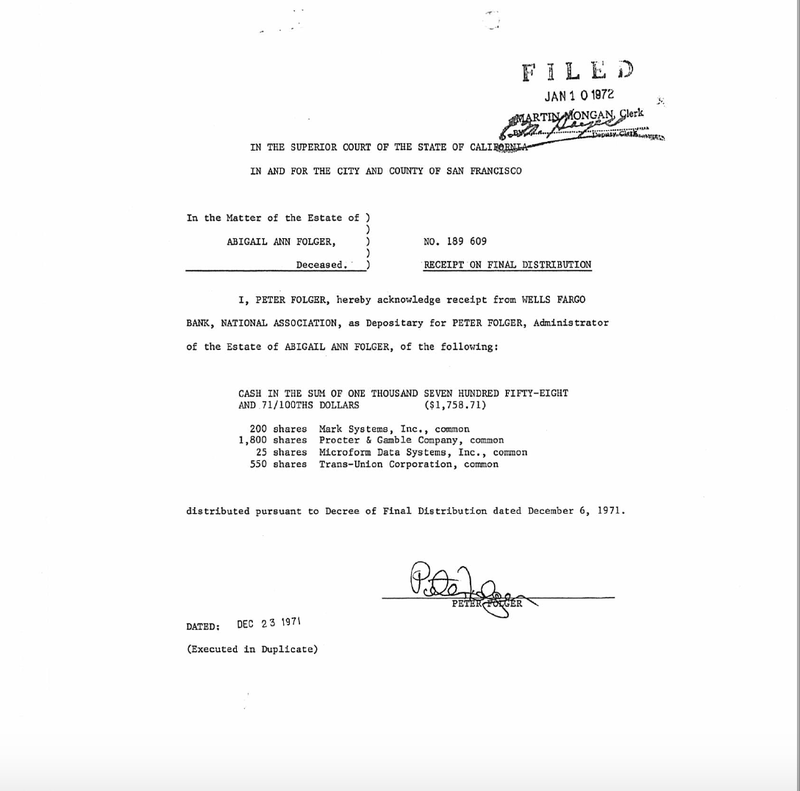 It is also possible that she paid first and last month’s rent when she signed a lease and the term started in September, 1968. This would tend to conform to the accepted narrative that she and Frykowski came to LA sometime in the early fall of 1968. 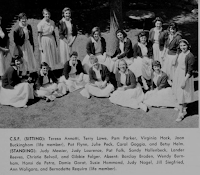 Below is the complete inventory of Abigail Folger’s estate. 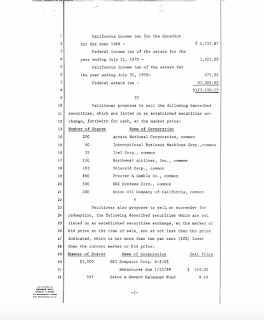 After the receipt of addition stock dividends and the addition of a small savings account that were not listed in the original inventory a supplemental inventory was filed. Abigail’s estate was worth approximately $408,000. Adjusted for inflation that would be approximately $2.7 million today. Included on the inventory are four promissory notes each with an interest rate of 7.5% totaling $8,000 ($2,000 each) loaned to Sebring, Inc. 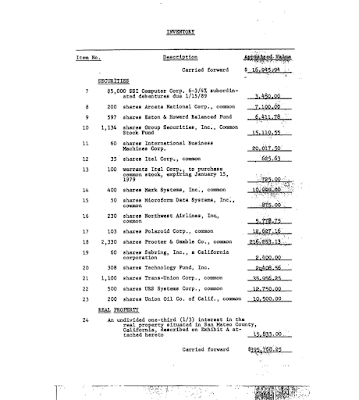 The inventory also reveals that in addition to loaning money to Sebring, Abigail also owned 60 shares in Sebring, Inc.
A significant portion of Abigail’s estate, approximately $123,000 went to pay taxes, including estate taxes. Her brother received the proceeds from a life insurance policy (about $50,000), which is not included in the estate total, above. The remainder was divided equally between her mother and her father. The estate was closed in November, 1971. There is no indication in the file why it took two years to close the estate. 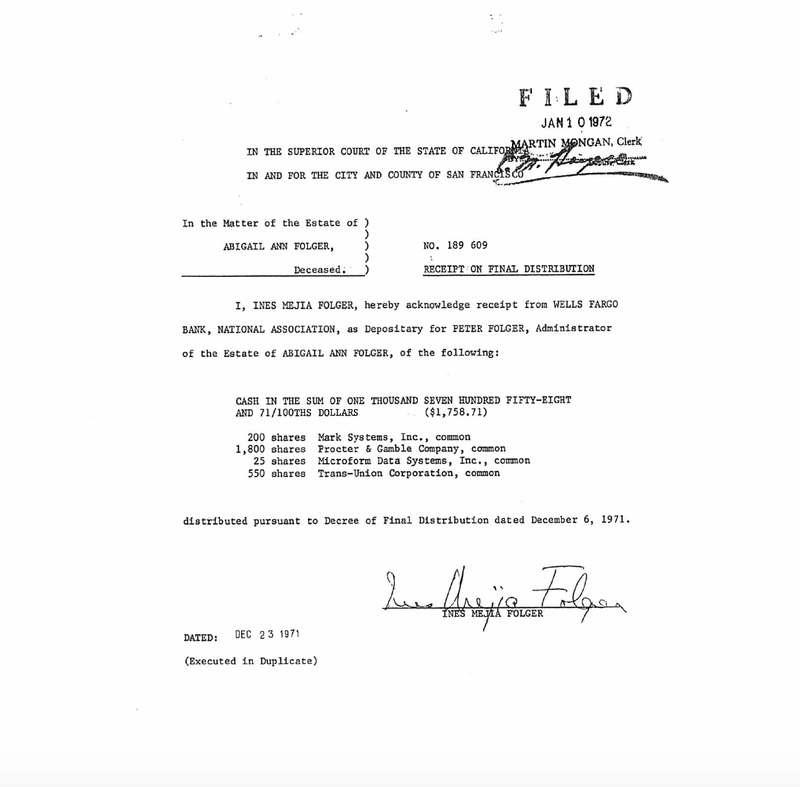 There is no record in the estate file explaining what happened to the Sebring loans. There is no order allowing the ‘sale’ of the promissory notes and they do not appear in the final distribution. 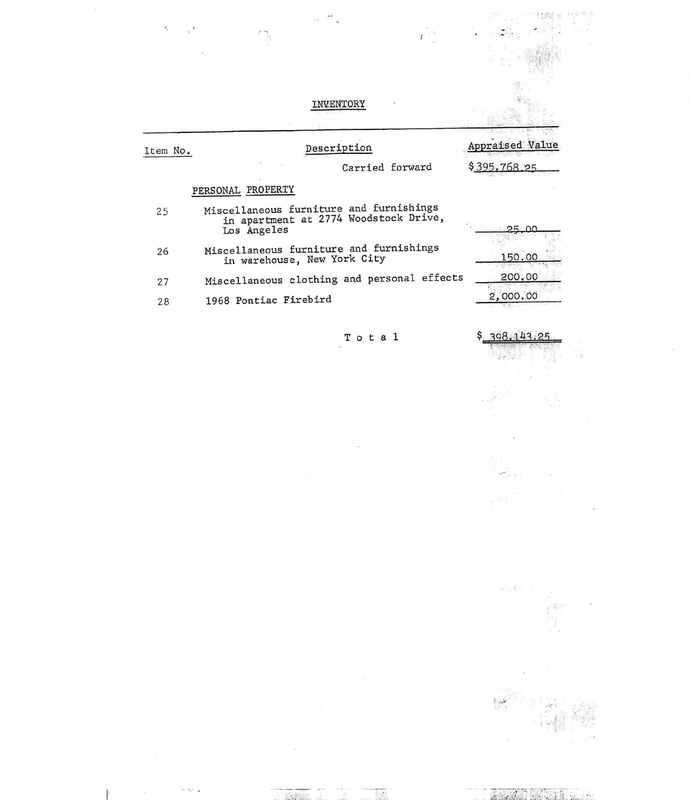 The inventory recites that the loans were to Sebring, Inc., not Jay Sebring, personally. 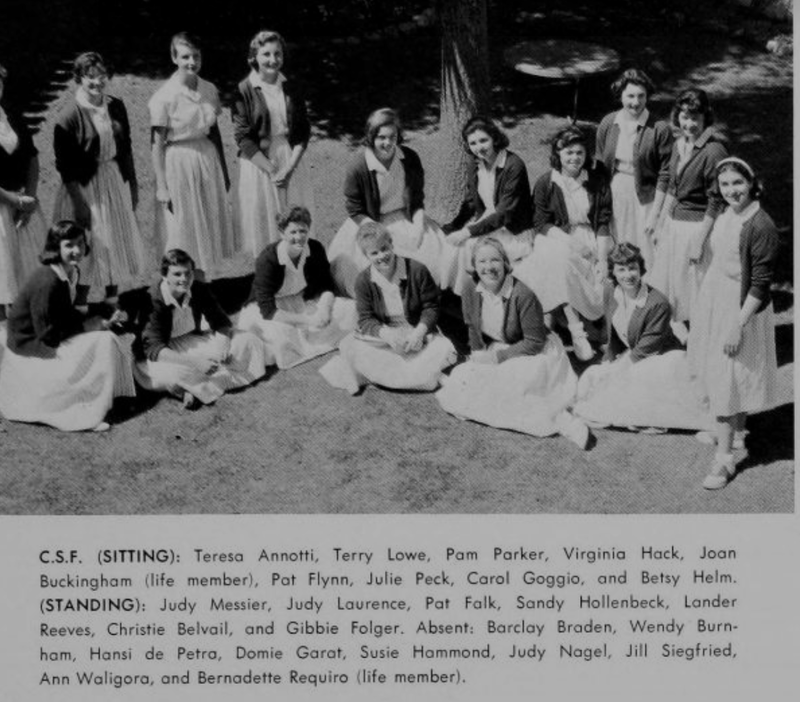 If they would have been personal notes the appropriate procedure would have been to file a claim against Sebring’s estate. Since they were corporate loans that avenue was not available. 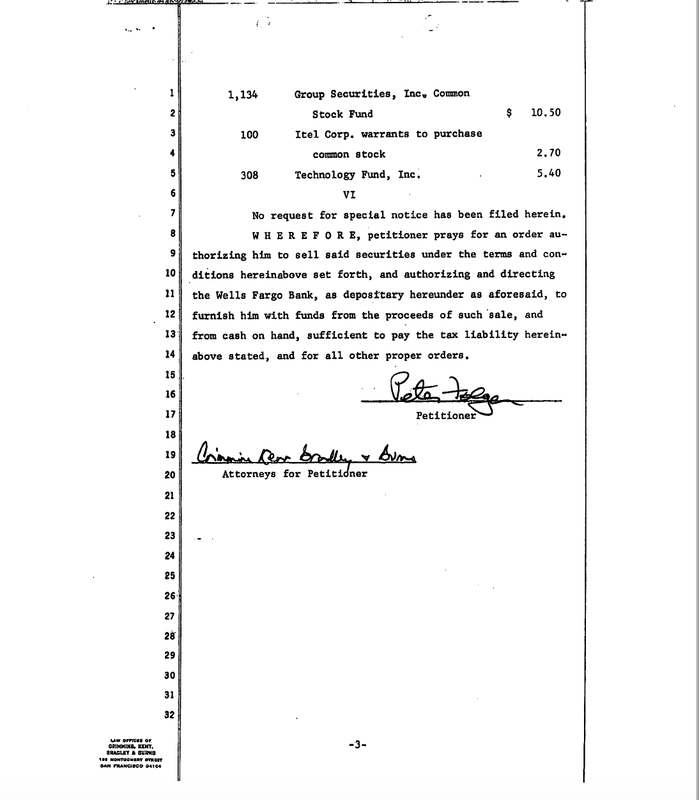 It is possible the notes may have been paid after Sebring’s death by the corporation and simply appear as cash in the estate. 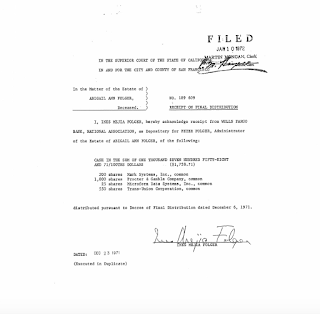 It is not possible to track the cash after the estate filing, especially since Inez Folger and Peter Folger waived an accounting of the estate. The Sebring notes were due on January 2nd 1971, 1972, 1973 and 1974. This struck me as a little bit odd. Typically, I would expect to see a single note with a payment schedule. However, the notes all have the same due date, January 2nd and the same amount of interest due. That would tend to suggest they were signed separately but at the same time. 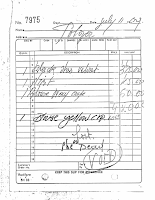 The cover sheet signed by the appraiser states that he valued the assets as of the date of death, August 9, 1969. $15.62 was due on each note. The interest rate was 7.5% per year. 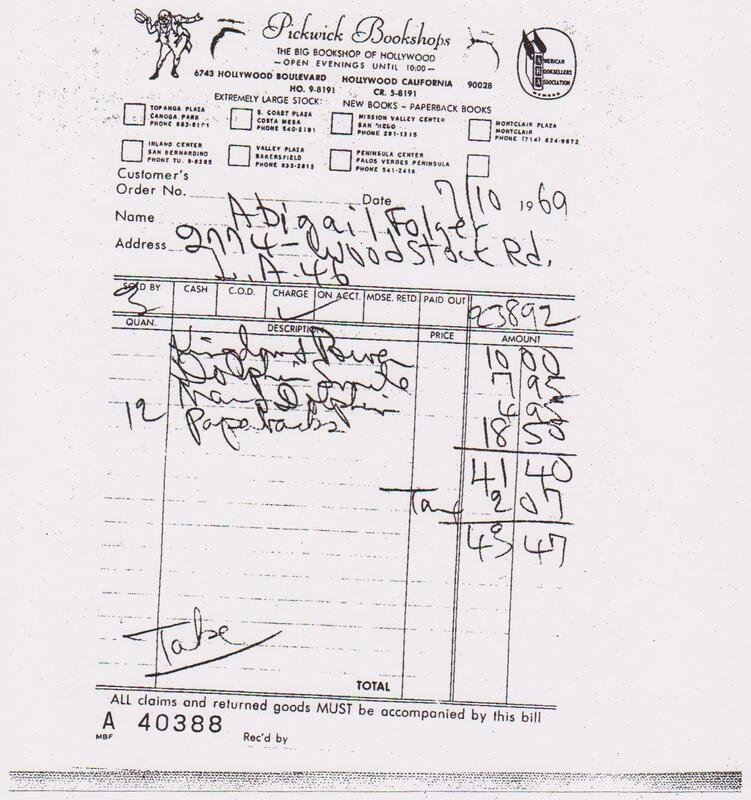 That translates to 41 cents per day and means Abigail received the notes on July 2, 1969. It is interesting that the loans were not personal loans. If Sebring Inc ‘failed’ Jay Sebring could have ‘stiffed’ his investors. 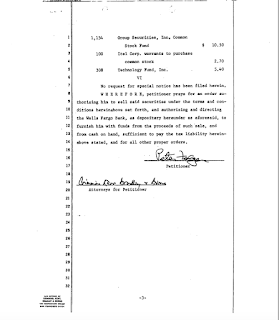 Sixty shares of Sebring, Inc are also listed in the original inventory and in the final accounting submitted to the probate court by Peter Folger. However, those shares also do not appear in the final distribution and again there is no record of what happened to them in the file. We know that Abigail did not hold a paying job during the year 1969. She was either a volunteer social worker or a campaign volunteer for Tom Bradley. Gibbie’s estate file provides enough information to make a rough estimate of her actual income from her various assets. 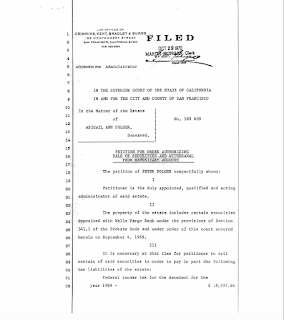 That file contains a request to the court to liquidate stock to pay taxes. The bulk of those taxes are estate taxes. 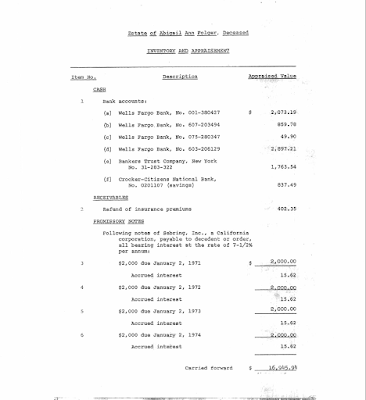 However, Peter Folger also needed to pay Abigail’s income taxes for the year 1969. We know she paid $18,997 in taxes. 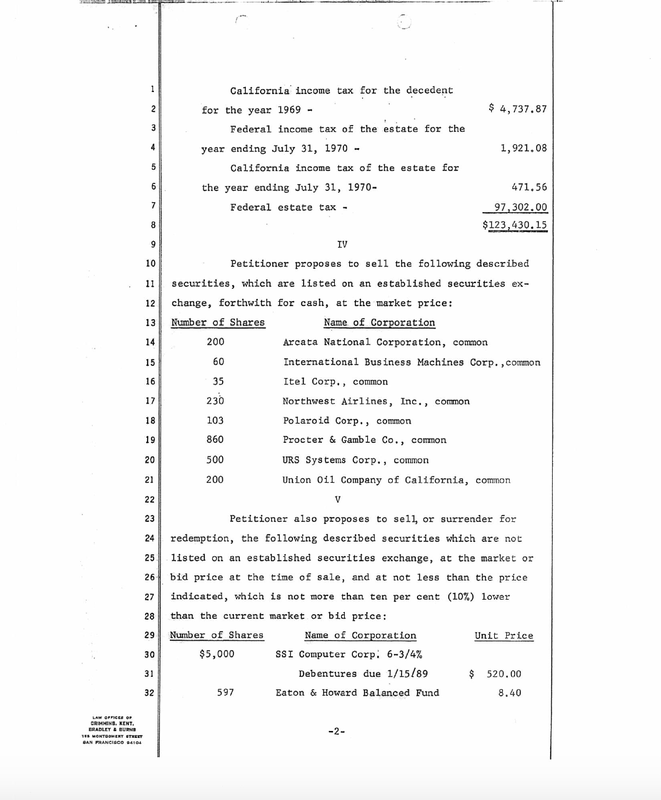 I moved the slider to 1969 and increased the income to various numbers eventually reaching $275,000. The effective tax rate at that level of 2012 income in 1969 was 43.1%. 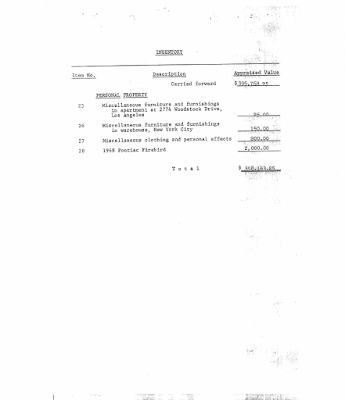 This also reveals a 1969 income of $43,958. I multiplied that income figure by the effective rate and it generated a federal tax liability of $18,945. That is pretty close to what Abigail owed. That would mean her income for 1969 was about $44,000. Adjusted for inflation that would be about $290,000. But there may be a catch. 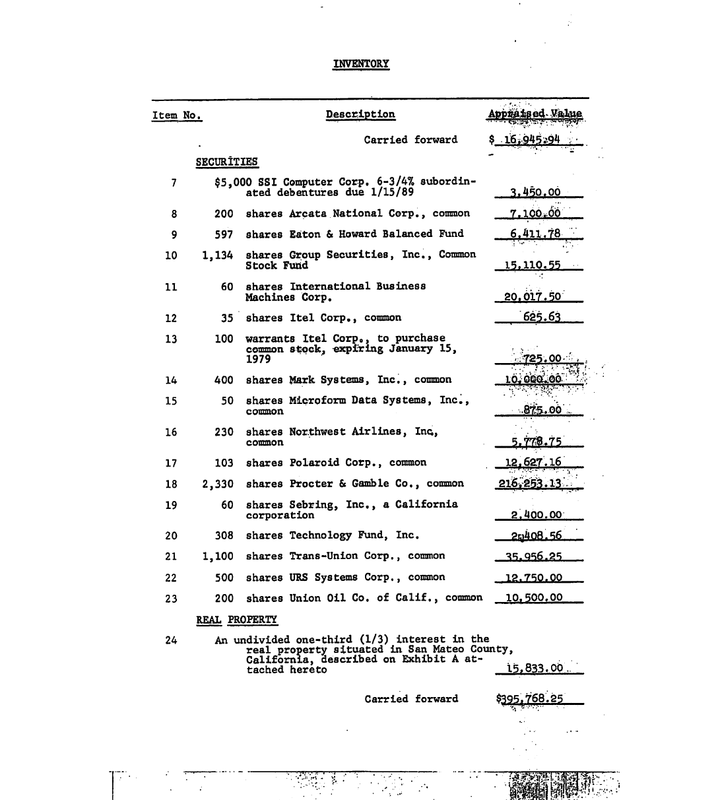 Assuming the tax law was the same in 1969, Abigail Folger’s annual income from all sources could have been more in the range of $75,000 per year (or $500,000 today) assuming the $44,000 was received equally over seven months. Divide $44,000 by seven and multiply by twelve. It is unlikely she received a set income each month given that her income was derived largely from dividends, interest and stock sales. While interest income would be consistent, dividends are typically paid quarterly and can vary quarter to quarter. A stock sale could happen at any time. I believe it is safe to assume her annual income was somewhere between the two numbers or about $50,000 per year in 1969 dollars. 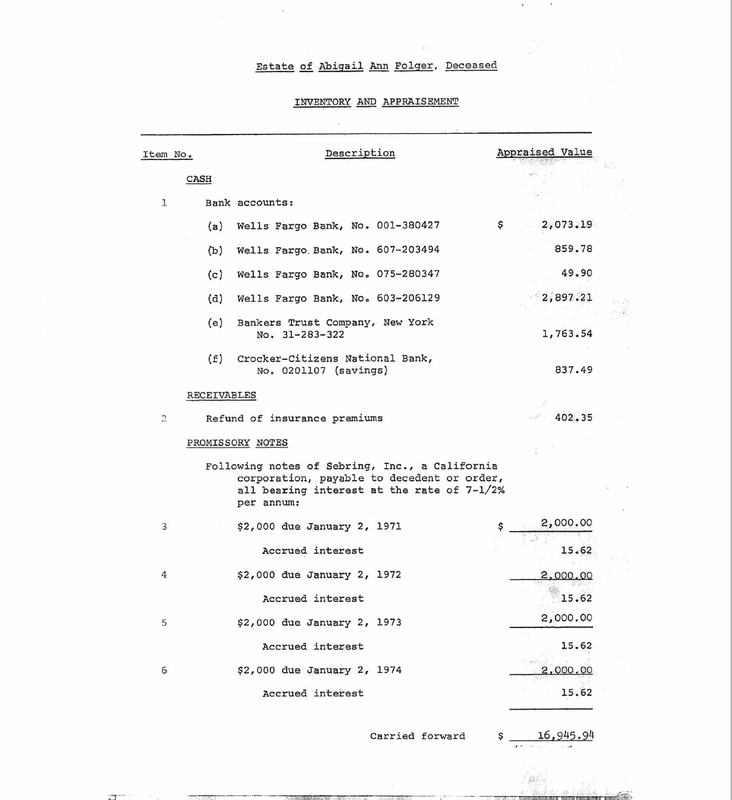 One of the small assets listed on the estate inventory, above, is a bank account at Banker's Trust Co. in New York. This account may be evidence that Abigail may also have been the beneficiary of a trust fund above and beyond her personal assets. Back in the day Banker's Trust, as the name implies, managed trust funds. 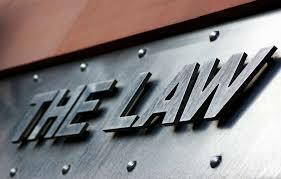 If she was the beneficiary of a trust the assets in the trust would not appear in her estate. The terms of the trust agreement would determine what happened to her interest in the trust after her death. It would pass to other listed beneficiaries. Abigail Folger was a very wealthy young woman. She certainly had little to worry about, financially.